Toubkal Trek: A fabulous 4-day hiking option to the summit of Mount Toubkal, using a route through the higher passes of the Atlas Mountains. 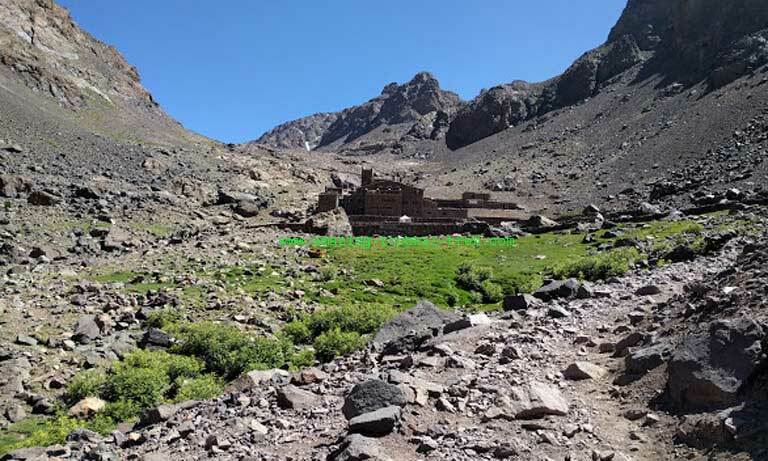 Toubkal trek from Oukaimeden will allow you to have an impressive view of the high mountains, the views of several Berber villages and meet friendly Berber people. – Discover traditional Berber villages. We leave Marrakech and drive towards Oukaimeden which is the trek’s starting point, and where we’ll meet our mule team. We visit ancient carvings, then walk towards Tacheddirt passing by Tizi Nadi to arrive at the valley. Overnight in local Gîte or tents. 5 hours trek. After breakfast, we start our trek from Tacheddirt and head towards Tizi n’Tamatert pass. We Descend to Imlil valley, then to Armed where will spend the night in a local gîte. 4 h trek. Early in the morning, after breakfast, we’ll start hiking up towards Sidi Chamharouch Shrine, which attracts tourists and pilgrims. After approximately 3 hours of trekking, we take a break for lunch somewhere in the trail. We continue climbing towards the refuge. The night will be spent in a refuge or tents. The walking time is 6 hours. Early departure after breakfast for the ascent of Toubkal. 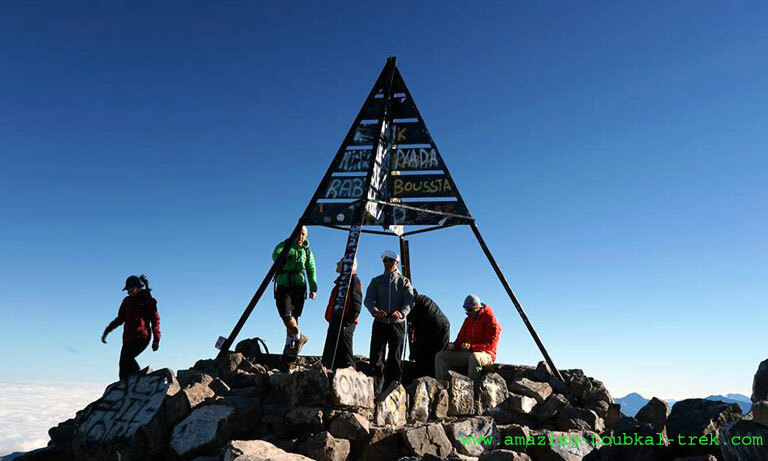 At the summit, we will enjoy the beautiful scenery of the Atlas Mountains, the peaks of the Anti-Atlas and its highest point Siroua (3304m) as well as the Haouz plain. We descend back to the Refuge for lunch, then back down to Imlil for the pick up back to Marrakech. About 8 h trek. 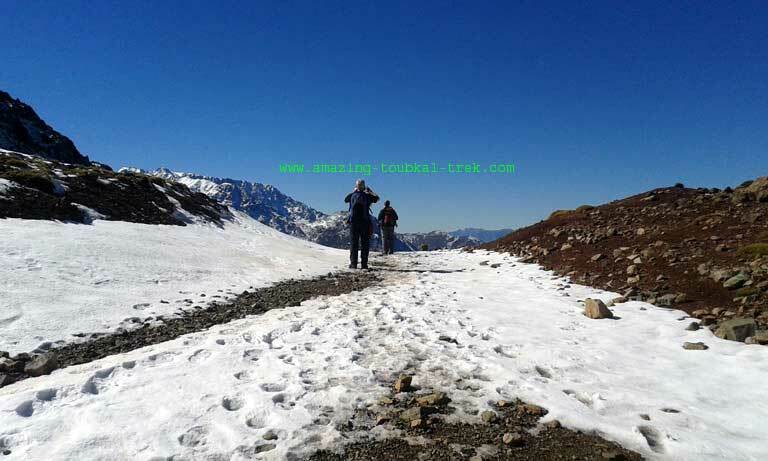 – This Toubkal trek is available and can be arranged for groups of all sizes. – Extra 10€/person extra from November to April to cover porters & extra for mountain refuge winter rates. 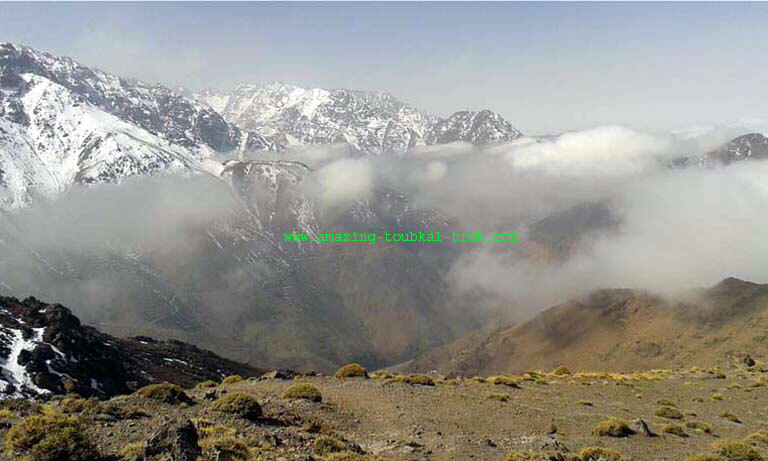 Toubkal Trek from Mount Oukaimeden through Berber villages to climb North Africa’s highest mountain. Mount Toubkal Trek, Hiking from Oukaimeden to Mount Toubkal.